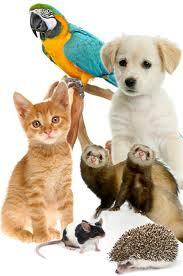 Our facility boasts 30 indoor/outdoor runs for dogs plus comfortable cat condos as well as facilities for exotics. All runs and enclosures are cleaned and sanitized daily. Dogs get supervised time outside in one of our four fenced play yards or if requested a leashed walk. All our boarders enjoy plenty of loving attention from our skilled kennel technicians! We encourage you to make reservations early. Please call the clinic at (303)670-0838. To facilitate check in, fill out our boarding forms and bring them with you to check your pets in. In order to board your pets they must be up to date on ALL vaccinations. Since we are a veterinary clinic, we are able to administer any vaccines they are due for. If they have gotten vaccines at another vet clinic, please let us know at time of scheduling so we can contact that vet for updated vaccine records, or you must bring in written proof at the time of drop off. We also offer any veterinary care your pet may need while boarding with us! Canine boarding includes a 10-15 minute supervised play time in one of our play yards or a leashed walk, dry food, dishes, bedding and their own inside-outside run. Two dogs from the same family can stay in one run if they get along well. In the case that two dogs staying in the same run, there is a 15% discount on the 2nd dog. Feline boarding includes their own multi-level condo complete with a cozy bedroom. Their stay also includes dry food, dishes and bedding. We ask that for your safety and your cat's comfort, that you bring him/her into the clinic in a carrier. If your pet is on a special diet, please bring that with you in a reclosable container like a Tupperware or Rubbermaid. If we have the brand and kind of special diet you are feeding, we can feed your pet with it but you will be charged for the bag or amount of cans given. Please make sure we have your desired food in stock and set aside for you if your pet has a special diet and you are not bringing food with you. We can administer medication to your pet for an extra $2.00/day as needed. We are a full Veterinary clinic, so if your pet needs to see a doctor we can most certainly fit them in the schedule while they are staying with us. 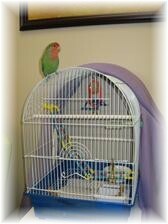 If you are bringing in an exotic for boarding (birds, rodents, rabbits, chinchillas, etc), please bring both the food and the shelter/cage that your pet will need during its stay. If you have questions about this, please call us previous to your check-in date. We recommend that you reserve boarding with us at least 3 months in advance for holidays. If we are booked for the dates you need, we will be happy to put you on our complimentary waiting list. Due to the high demand for holiday boarding reservations, there is a $50/pet deposit required at the time of booking for any holiday reservation. If the reservation needs to be canceled, it must be done 72 hours/3 Days before the check-in date to have the deposit refunded. If the reservation is kept, the deposit will go directly towards the resulting boarding charges. Winter break (2 weeks), etc.